You might remember last year that Brian surprised me with a trip to Banff for my birthday. I think planning that alone was a little stressful for him so this year he told me to pick the destination for my birthday trip. At first, I thought of flying into LAX and camping at Joshua Tree National Park. Great idea in theory but all the reservable campsites had been spoken for already. I am adventurous, but basing my entire camping trip around extremely popular first-come-first-serve campgrounds is a little TOO adventurous for me. Brian believes he is lucky, but I tend to take a more pragmatic approach. With my Joshua Tree plan foiled I decided we would still fly into LAX since flights there from Seattle were so cheap. California has a ton of great outdoor locations to visit and I was looking at various campsites you can reserve on the recreation.gov website when I came across the Lone Pine Campground. The view looked familiar and I realized, this is near Alabama Hills! I have wanted to camp at Alabama Hills for a while but somehow forgot while I was planning this trip that it was an option. While you may not know about Alabama Hills by name, chances are you have seen this area in a TV show or movie at some point, as it’s an extremely popular Hollywood filming location! The road you drive down to reach the campsites is even called, “Movie Flat Road” Before white settlers and eventually Hollywood stumbled across this location the Paiute Tribe called this land home and you can even find pictographs in the rock formations. 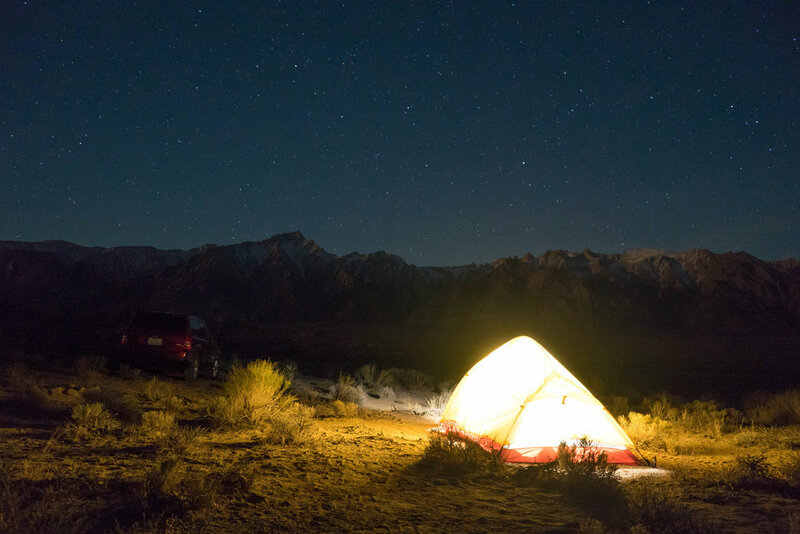 Now Alabama Hills is managed by the Bureau of Land Management, which means there is free dispersed camping. There are some rules in place surrounding this so double check the BLM site before planning your trip! With our destination chosen, I informed my nature-hating boyfriend of my plan. He wasn’t the happiest camper (haha see what I did there), but a free place to sleep, and the fact that it was my birthday kept him from complaining too much about the situation. I have a horrible habit of picking the earliest possible flight to save money and pack as much as possible into the day. I forget that not everyone gets excited about driving 3.5 hours to the middle of nowhere with me. We had a 5am flight and landed around 7:15am in LA, we picked up our rental car and Brian immediately asked me if we could stop at his friend’s house to take a nap. I was super excited to get going, but also wanted Brian to have a good time on this trip so I allowed it. We slept until around 10 am and then began our drive to Lone Pine, California. After picking up supplies we pulled onto Movie Flat Road and began our search for a campsite. A lot of campsites were taken on the beginning of Movie Flat Road but I wasn’t worried because Movie Road stretches on for a long while. We ended up turning down a little side road and found a campsite with a beautiful unobstructed view of the Sierra Nevada Mountains. Our campsite! You can see Whitney Portal Road winding up the mountains in the distance. I set up our tent and made dinner while Brian slept in the car. Word of advice, it may cost more, but always add a second driver to the rental car when driving long distances like this, it will keep one person from being exhausted the majority of the trip. We ate our food and enjoyed a bottle of wine before Brian turned in for the night. I stayed up a little longer to work on my night photography! Our campsite under the stars. Hoping to keep Brian from hating me I didn’t wake him up with the sunrise and let him sleep in while I took photos. I also didn’t make him eat another dehydrated meal and when he woke up we drove back to Lone Pine to get breakfast and coffee. We charged our phones in the café for a while before driving out to Whitney Portal. There are signs at the trailhead about acclimating to the elevation before starting the Mount Whitney hike. I thought nothing of them since we weren’t in the Himalayas or some other mountain range with major elevation. Then I saw a guy running around the parking lot with a heart rate monitor reveling at how much higher his pulse was at the same effort he had given at a lower elevation. It all came together for me when I saw how much Brian was STRUGGLING on this hike. He is a super fit guy, but he needed to stop and rest every 20 mins or so. Altitude affects everyone differently and after that experience, I am thinking it is safe to say I shouldn’t bring Brian on an Everest Base Camp trek. After a slow hike to the top, we finally made it to the lake and hiked around to the far shore to get some solitude from a slightly annoying family that had reached the lake at the same time. We spent a little time at the lake, and I could see Brian was still struggling. Hoping to motivate him I offered to buy him a BBQ lunch at a spot I had seen in town. That seemed to do the trick because he took off down the mountain and kept telling me to hurry up on our descent. Food is definitely a motivator for this guy! We made it back down to the trailhead super quickly and ate BBQ at the Lone Pine Smokehouse. I originally thought this was a place Paulina Dao had recommended to me, but apparently, there is ANOTHER BBQ spot in Lone Pine called Copper Top that is supposed to be amazing. I wouldn't know since I went to the wrong place ¯\_(ツ)_/¯ The brisket was still super good at the Lone Pine Smokehouse though! Lone Pine Lake is surrounded by gorgeous peaks! After lunch, we returned to our campsite to nap and relax for a bit before checking out the Mobius Arch trail for sunset. It’s a short .6 mile loop off of Movie Flat Road in Alabama Hills. When the sun started to set at our campsite we made the quick drive to the trailhead, and then couldn’t find the arch until our second loop of the hike. If you are hoping for some Arches National Park style arches…this is not the arch for you. It’s small, but if you frame it right you can photograph Mount Whitney through it. I was not as merciful the third morning and woke Brian up right at sunrise since it was an amazing one! The sky was filled with perfect wispy pink clouds. After watching this beautiful sunrise Brian and I packed up camp and headed further north to the Hot Creek Geological Site. Hot Creek is exactly what it sounds like, a Hot Creek. Most of it is fenced off because it is hot enough to actually hurt and/or kill you. Heed the warning signs and don’t try to go around the fences unless you are a fan of melting your skin off. When you go further down the trail the fences end and you can wade in the creek if you like. We saw a few people trout fishing along this portion! This next part of the trip didn’t go quite as I had hoped. There are supposed to be a lot of Hot Springs near Hot Creek Geological site, but I wouldn’t know since I never found one. We drove down the roads they were supposed to be on and never came across one. It didn’t help Brian was really getting super worn out and the roads are all rough dirt roads which tends to make him a nervous driver. The Hot Creek area is also BLM land meaning it’s another spot where you can take advantage of dispersed camping. This was my original plan, but I could tell Brian was really over the intensive nature weekend I had put him through. In hindsight, I probably should have planned out our nights of camping with a night at a hotel in between, but it was too late for that at this point. Instead of torturing him with another night in a tent I agreed to cut the camping short and drive back to LA a day early so we could visit with a friend. There were a lot of things we could have done if we had continued a little further north though! Next time I am in the area (and maybe staying in a hotel with a shower) I want to head to Mammoth Lakes as well. While camping with Brian didn't go exactly as I hoped, I still enjoyed this trip and exploring in this area. Have you explored the area around Alabama Hills? What were your favorite parts? I would love to hear about your trips in the comments!